I’ve been reading about Aleppo pepper for a few years now, but I’ve always had a hard time finding it at the store and I’m trying not to make so many online food purchases. I figured that I would run into this elusive spice someday and sure enough, that’s what happened last week. I’m really not sure how it took me an entire year to notice that multiple stores in Fresno stock this amazing crushed pepper. Thanks to the large Armenian population here, we have some fantastic local markets filled with Middle Eastern and Mediterranean spices and crushed Aleppo pepper is readily available at all of them. I found the Aleppo pepper when I was out exploring Armenian markets with my boyfriend Phil. Together, we’ve recently started a local food blog called Fresno Flavor that will talk about market finds and what to do with all the amazing fresh produce we have here. Armenian food is an important part of the local food scene, so we decided to get out and start learning more about it. We’ve visited a handful of bakeries, delis, and markets, but there are still many more places to visit. I can’t wait to go check out some more! I’d love it if you’d head over and check out what we’re doing. The heat level of Aleppo pepper falls somewhere between mild paprika and spicy crushed red pepper. It’s mild enough that you can season foods generously without worrying about burning mouths at the dinner table. What I really love about this pepper is the flavor. While sweet paprika mainly adds color and crushed red pepper mainly adds heat, Aleppo pepper has fruity, almost citrus-like undertones that really add something special to whatever you sprinkle it on. Now I know why I’ve heard so many people rave about it! Since I bought the container, it hasn’t left the side of my stove and I’ve been sprinkling it on just about everything. Most recently, I added it to some sauteed summer squash and found that it changed the flavor of one of my summer staple side dishes dramatically and for the better. 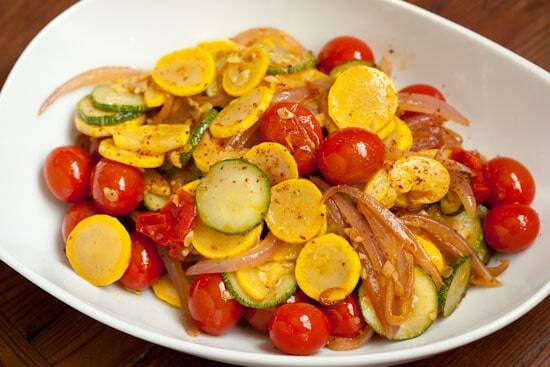 I make some variation of this every summer when squash is in abundance. I usually just chop up whatever I have on hand and throw it all in a skillet with some olive oil. Yesterday I had half a large red onion, some yellow squash and zucchini, and a handful of cherry tomatoes. I cut it all up, let it cook until the moisture evaporated enough for the veggies to take on a bit of color, then seasoned it up with salt and Aleppo pepper. Simple and delicious! Heat a wide skillet over medium heat. Add olive oil and butter then onions. Cook onions, stirring, for about a minute, then add the chopped garlic and stir for another 30 seconds. 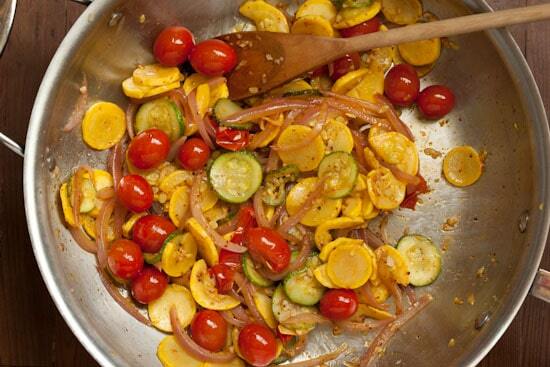 Add the rest of the vegetables and a generous pinch of salt and cook, stirring occasionally, for 12 – 15 minutes, or until the squash and onions start to take on a bit of color and the tomatoes are bursting. Remove from heat and add Aleppo pepper. Taste and adjust seasonings as desired. Sounds like an amazing spice...where exactly in Fresno did you find it? I'm crazy about Aleppo pepper, which I first tasted when a blogging friend from Turkey sent me some. I've been using it ever since. 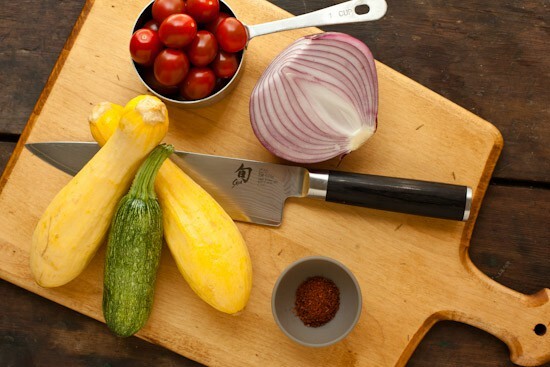 I this it would be delicious in these sauteed summer veggies! Thanks so much for linking to my recipe. I'm a huge fan of Aleppo pepper (and also urfa biber, which is similar), but not such a huge fan of yellow squash. Great idea to pair them. I also love Aleppo in scrambled eggs; have you tried that yet? Jessica - I bought mine at Fresno Deli on Gettysburg at Fresno and I know for sure they also have it at Royal Market on Bullard at Marks. I made a very similar dish the other day, but the only difference is that is the aleppo pepper. I am going to try too... Looks delicious! I bought a big bag of aleppo pepper when I was in NYC in June and I'm using it almost daily. I love it!! I've got to find a shop in Vancouver that carries it or I'll go crazy. As for your dish, it looks perfect for all the zukes and tomatoes this time of year. My kind of side dish. So colorful and fresh! I have not heard of the aleppo pepper before, but it is definitely now on my list of things to look out for now. I love aleppo pepper! This dish looks great - so bright and colorful and summery! holy cow this is a beautifully colorful and delicious plate of food! I want some. I love aleppo pepper as well. I've always ordered it from Penzey's then they built a store 10 minutes from me - bonus!! This dish looks great. So bright and colorful. Perfect way to use up summer veggies. I already have fall fever...pumpkin donuts and apple crisps. Yum! Hi! I am in love with your blog!! I want to eat everything on herrrrreeeee ... starting with the roasted artichokes.. in my oven right now :) I'll be posting about them on my little food blog, and will link it back to here.xxErica -Down Through My Ribs.